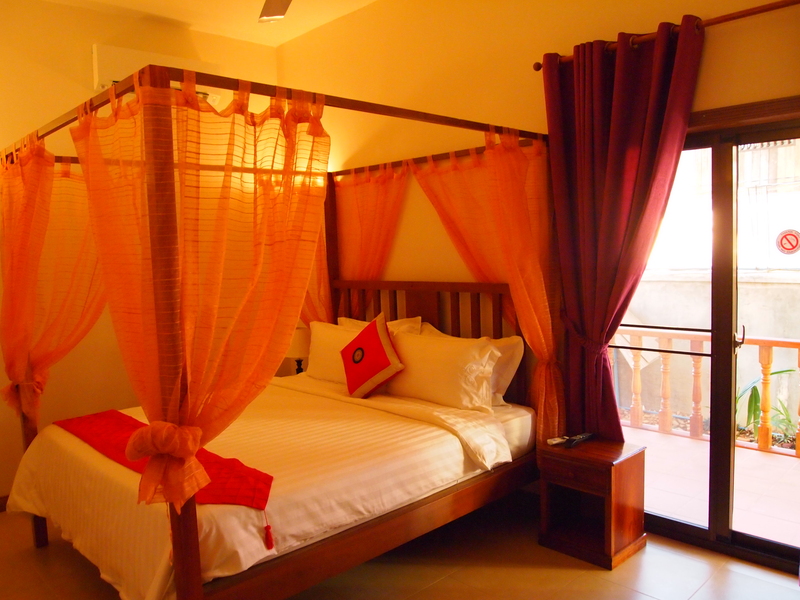 Thursday, January 20: In the morning, I take the 8:30 Mekong Express Bus ($11) to Siem Reap. It’s a 6-hour ride, and luckily it has a bathroom on board! I have never encountered an on-board bathroom on any bus since I’ve been in Asia, so I’m relieved I don’t have to worry about this issue! My bus mate is Richard, a 69-year-old Australian who was once a medical lawyer, then a nurse, and later an English teacher in Cambodia. 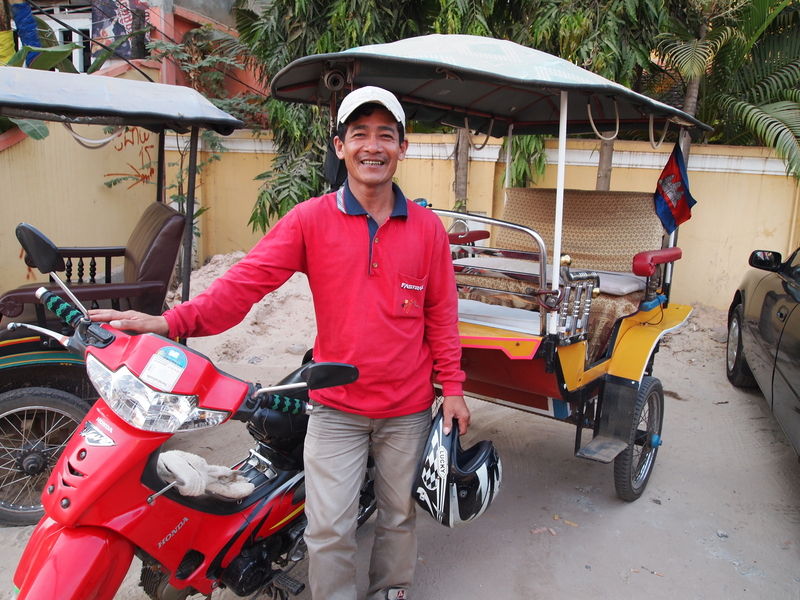 He’s lived here on and off for years and adores Cambodia and the people. His wife Janet died of pancreatic cancer in 2009; they had been together for 5 years but only married right before she died, at her request. Richard teaches me hello in Cambodian: sua s’dei (I hear it pronounced as sauce-a-day). Goodbye is lia suhn haoy (He tells me it’s just lee-high) and thank you is aw-kohn. He tells me that he has an apartment in Phnom Penh where he supports several Pakistani and Cambodian boys. He has put several Cambodians through college. He says he can afford it and he likes to know he’s helping to get some of them out of poverty. Richard is a talker, so the 6 hour bus ride passes quickly. He tells me that one of the boys in the apartment is getting married. His wife, he says, is very superstitious. She thinks if she looks over the edge of a balcony, the building will collapse. Recently, she found a lump in her breast. When Richard insisted she go right away to see a doctor, she refused, saying that particular day wasn’t an auspicious one to see a doctor. He tells how he just got a skin cancer removed from his forehead and now he’s numb on that side of his head. He remembers that Janet used to stroke his head as he lay in her lap. Ironically, Janet went and then the feeling in his head disappeared as well. When I mention my upcoming trip to Kyoto in February, he tells me in great detail about a Japanese film called Departures that made him sob. He says it’s funny how a film made him cry yet he never got emotional over Janet’s death. He celebrates her life and feels they had an amazing love that ebbed and flowed between them. He says Janet was the kind of person who either loved you or hated you. There was no in-between, no neutrality with her. As he flips through the newspaper, he reads me the local crime report which includes some burglaries and arson and destruction of property. 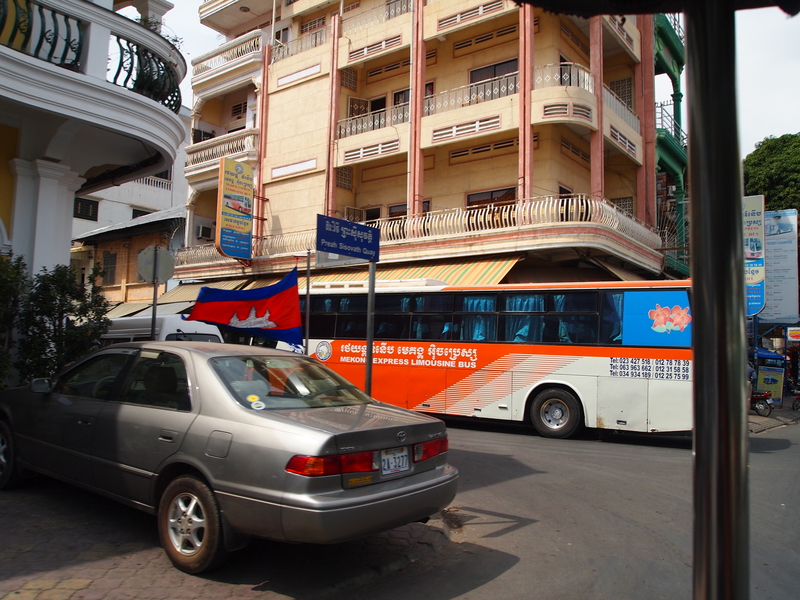 He says the police reports in Phnom Penh very often report decapitations among the locals. He mentions that in Tunisia, protestors are demanding the ouster of the current government. He then asks me, “What did you leave behind when you went to Korea?” I tell him my story. We continue to talk at some length about my life and people I know and about someone I’ve known and cared about for many years. He asks many questions about this person, and says the person sounds like a high-functioning Asperger’s Syndrome sufferer. I am taken aback by this and find myself becoming defensive. It just can’t be. But as he continues to ask questions, I am shaken when I find myself answering in the affirmative to most of his questions. Richard outlines the symptoms: awkward social interaction, stereotyped and restricted patterns of behavior, activities and interests, no clinically significant delay in cognitive development or general delay in language. An AS person does not withdraw from other people and may approach them and engage in a long single-minded discussion of a topic, without recognizing the other person’s impatience, disinterest or desire to leave. There is often a lack of social or emotional reciprocity. The person may stick to inflexible routines or move in stereotyped or repetitive ways. An AS person may have difficulty identifying and describing one’s emotions. Richard goes on and on analyzing this person I have known for many years and I am flabbergasted. Is he right? I have to go home and look this up. I wonder if it is true, if it has possibly never been diagnosed. I wonder if it would have made any difference in my relationship with this person if it is in fact true and if I had known it from the beginning. Would I have been able to live with it, adapting my behavior and my expectations to the syndrome? I don’t know. The conversation leaves me shaken, and wondering. This is something I will have to explore. 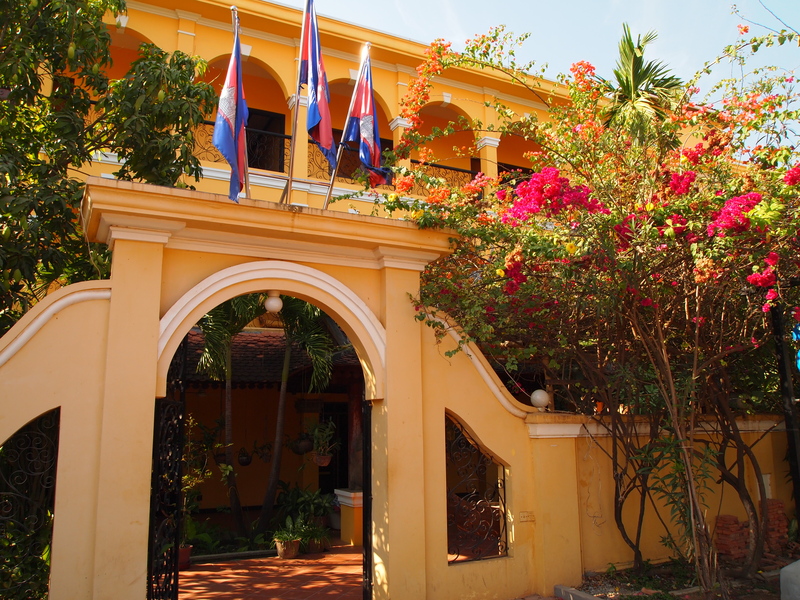 Later, we finally arrive in Siem Reap, where a young Cambodian guy picks me up in a van to take me to my hotel, Auberge Mont Royal. In the van I meet a Cambodian couple who left for Montreal on a study-scholarship in 1971, so they luckily missed the Khmer Rouge years. The man tells me since I’m an English teacher I should apply at the J. Prescott Academy, a school for Cambodian children in Siem Reap. I check into my lovely hotel, Auberge Mont Royal, on a little side street choked with dust, tuk tuks, and more concrete hole-in-the-wall businesses. My hotel sits within a yellow gate behind which lush greenery abounds. 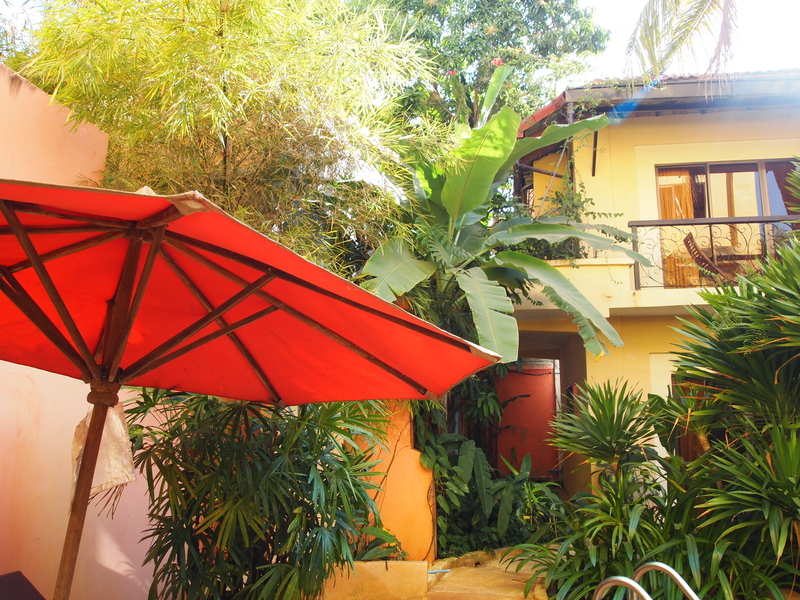 Across the street is the purple-painted Villa Siem Reap. The rest of the street is lined with dumpy businesses, nice guesthouses like exclamation points in an otherwise unsightly landscape. 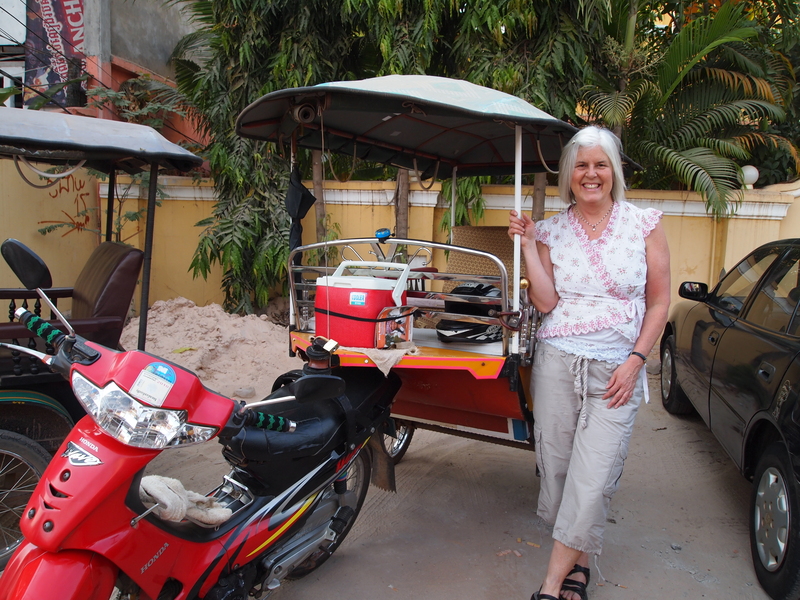 As part of the package I bought at this hotel, I get a tuk tuk ride to sunset at Angkor Wat. My driver and I take off right away and he drops me across the 2.2-mile-long moat that circles the outer gate of the famous temple. 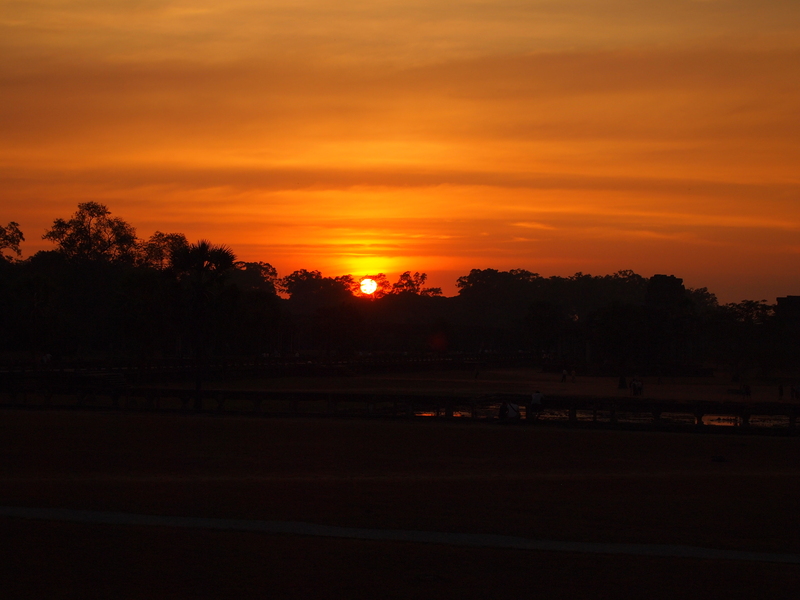 I walk across the moat and through this gate and there in front of me, across a wide expanse of lawn, is Angkor Wat. Immediately, I’m taken aback ~ and I have to say, disappointed. All over the front of the facade is emerald-green netting, put up for renovation, I assume. There is no way around it. No way to take a picture without the ugly netting. I walk up closer and find, despite the netting, the temple is still quite lovely because of the way the setting sun colors the stone. It’s rich and golden-red, glowing. I go inside the temple complex and look at all the beautiful carvings of apsara dancers and royal people and gods and battles and everyday life. Apsaras are beautiful, supernatural women. They are youthful and elegant, and proficient in the art of dancing. 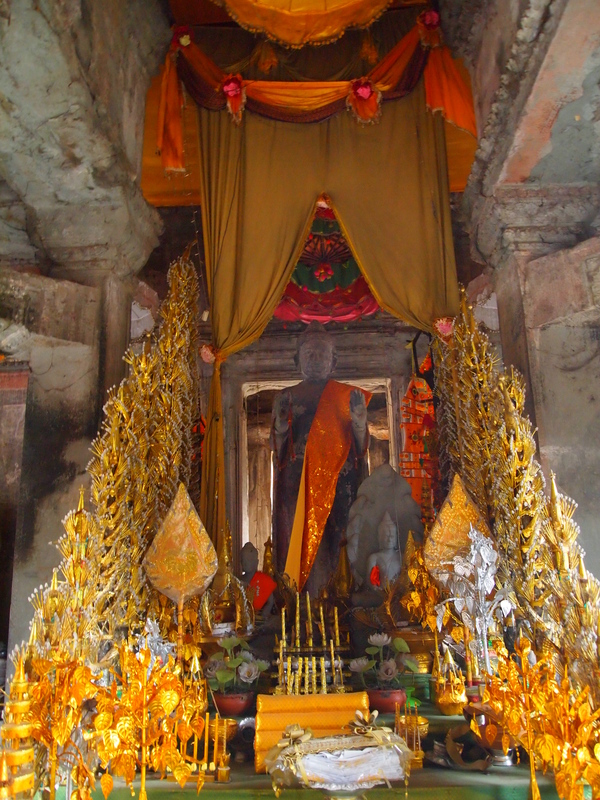 A huge Buddha wrapped in an orange sash surrounded by gold glitz and glittery leaves, flower offerings before him, beams serenely down at me. It’s stunning, the waning light on the temple. I wander around the ancient stone buildings, fading to skeletons in their slow decay. How many years before the temple turns to dust? How many centuries, how many generations? The power of nature is indefatigable. It slowly erodes everything man puts in its midst. 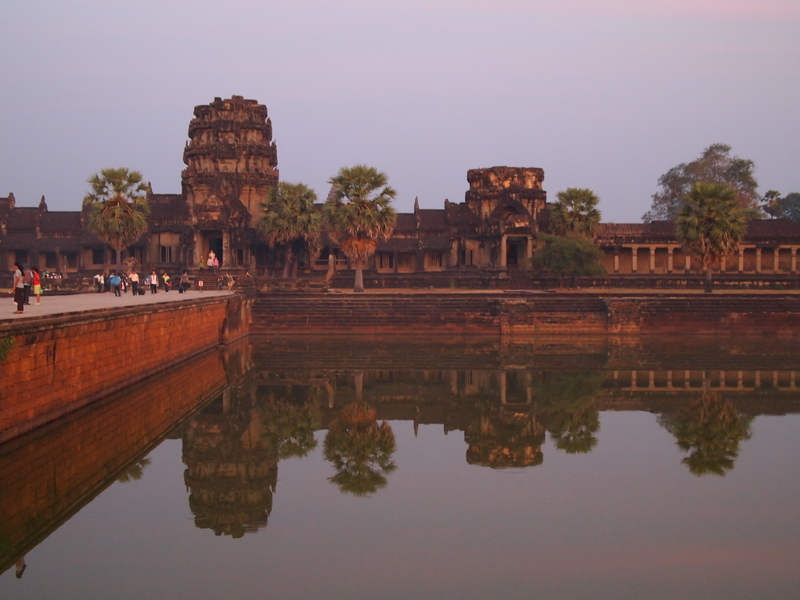 Most people know about Angkor Wat, but here’s a tidbit of history. 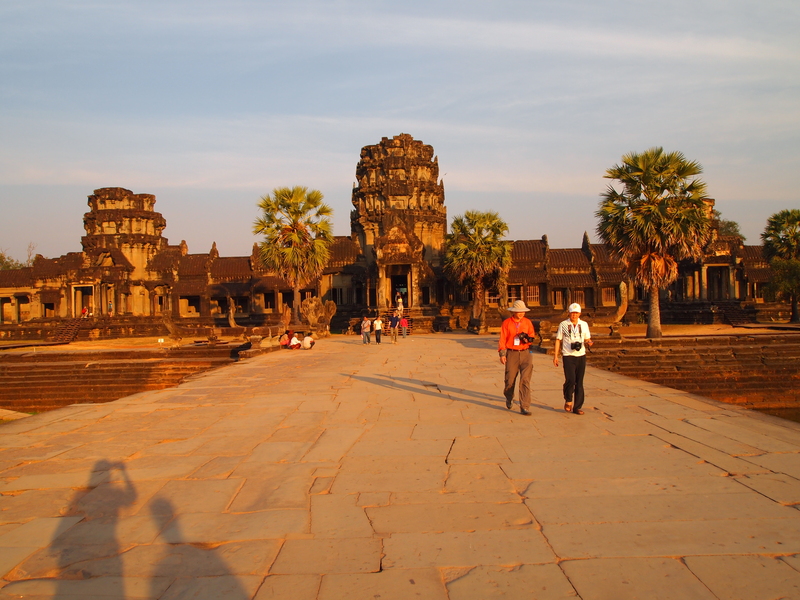 It’s a temple complex built by King Suryavarman II in the early 12th century. It was the state temple and capital city and was first Hindu, dedicated to the god Vishnu; later it became Buddhist. Apparently, it’s the world’s largest religious building. 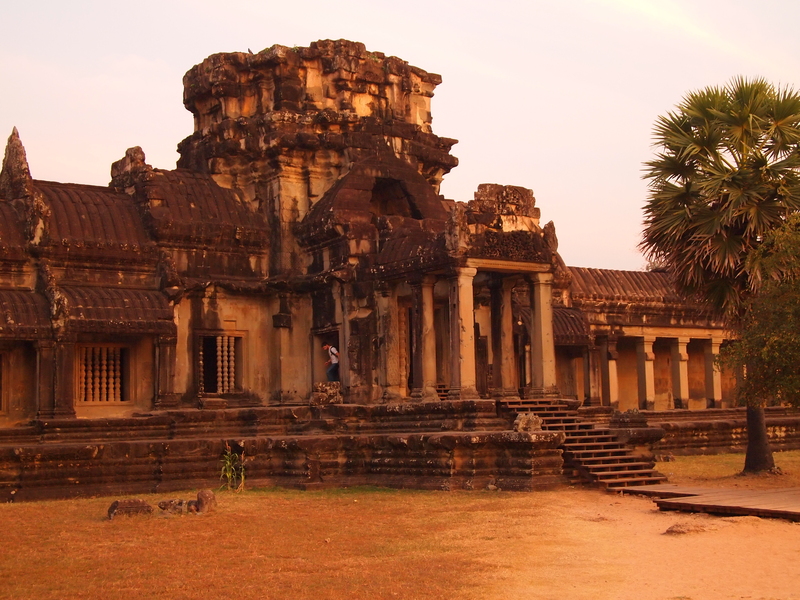 It’s said the building of this temple was likely the cause of the demise of the Khmer empire. I take my time wandering, captivated by the way the light attaches to the stone. The tuk tuk driver has told me it will probably take me 1 1/2 hours, so I enjoy slowly. 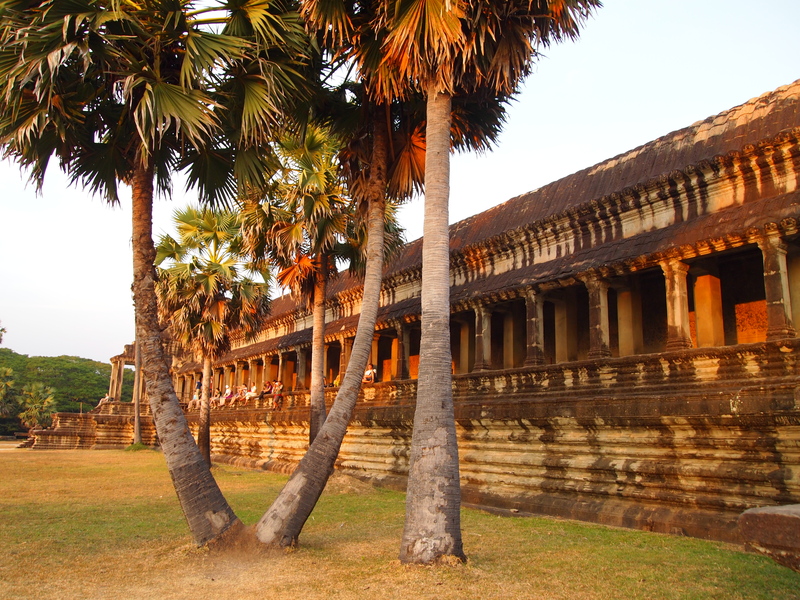 I know I will get a proper tour tomorrow, with an English-speaking guide, so I simply enjoy the warmth, the sinking sun, the multitudes of carvings. 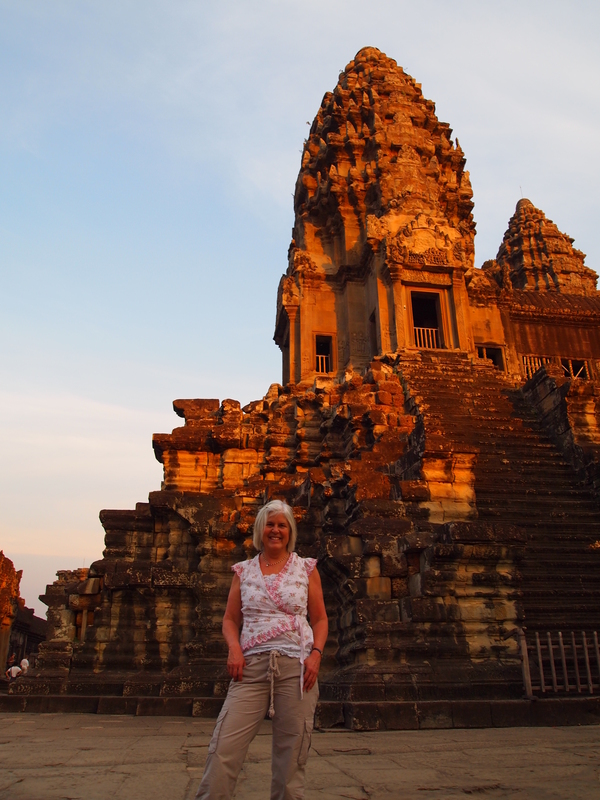 The front facade of Angkor Wat faces the west, so it’s impossible at sunset to get a picture with the sun behind it. 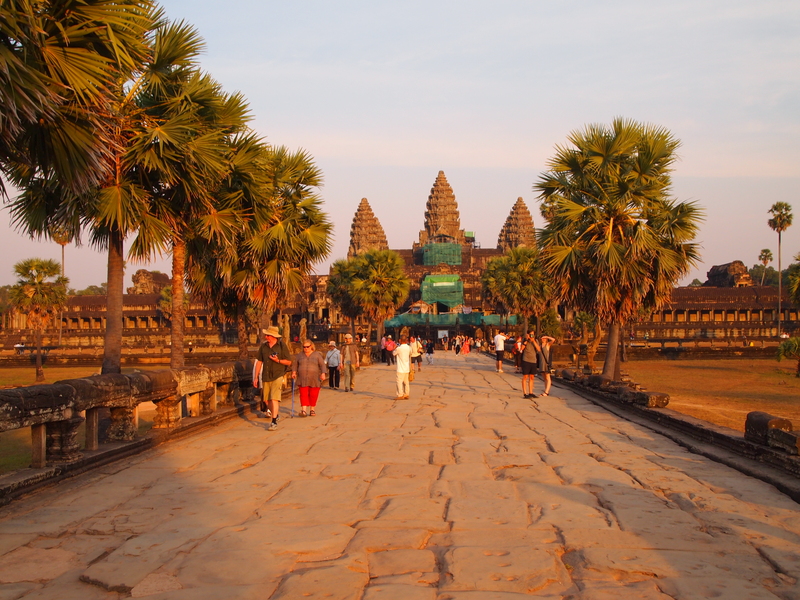 I sit on the front porch of the temple, or the balcony, with a smattering of other tourists and watch the sun set behind the outer gates surrounding the temple. Sunrise would be better for photos here. Still. The color of the stone, the shadows cast, are gorgeous at this time of night. 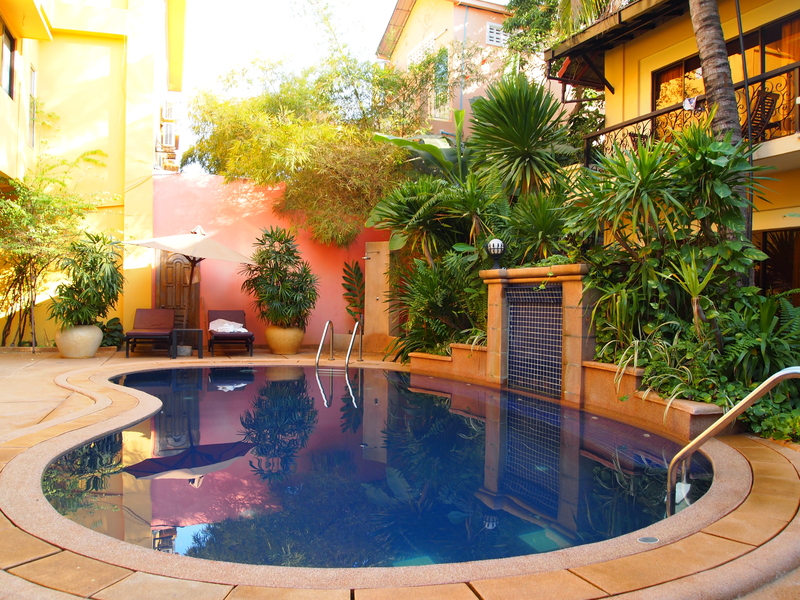 Later, I go back to the hotel and lie on a lounge chair by the kidney-shaped pool and read my book. 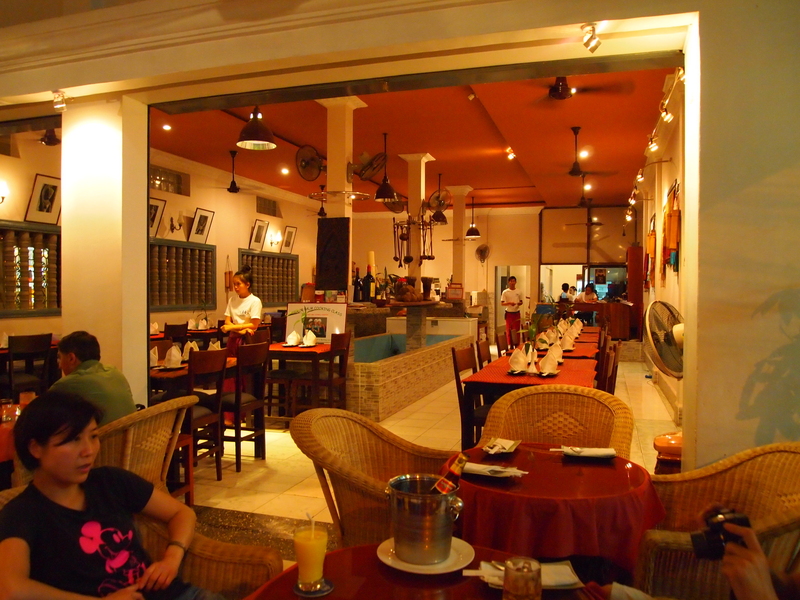 Then I take a tuk tuk to dinner in downtown Siem Reap, a charming little area overflowing with massage parlors, Khmer and Indian restaurants, and shops selling all kinds of enticing things. 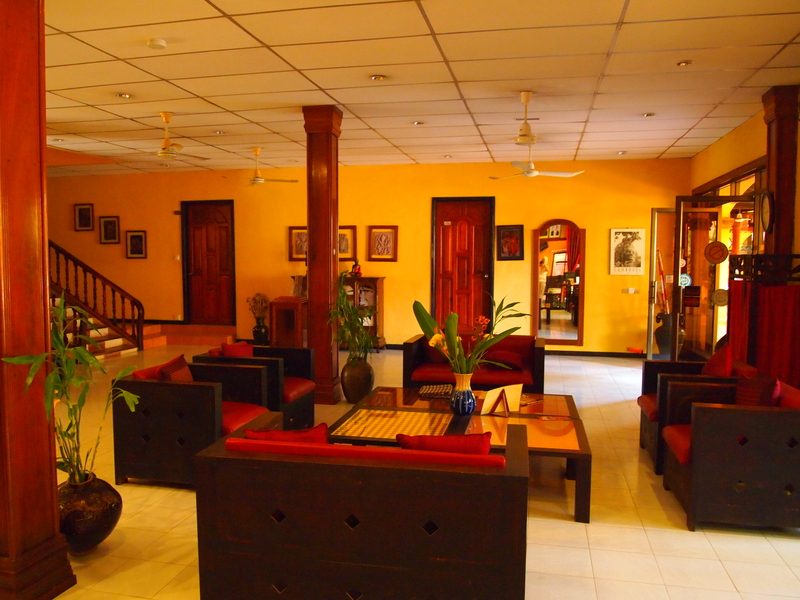 The Angkor Palm is a lovely colonial-type restaurant that spills out into the street. I sit outdoors on the sidewalk so I can watch the people walk by. 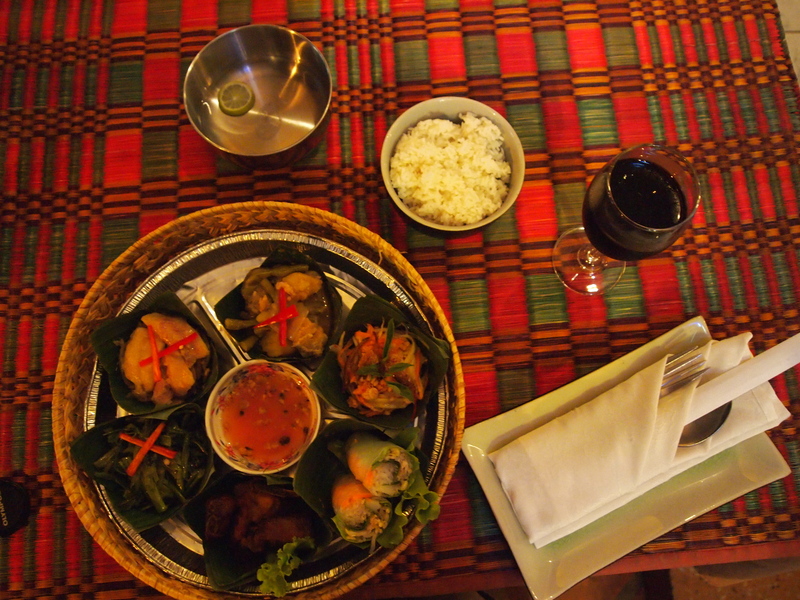 I order the Angkor Palm Platter for One. It’s a sampler of Khmer food: fresh spring roll, green mango salad with special smoked fish, local pork spareribs roasted with honey and spicy sauce, homemade green curry with chicken, cha’ta kuong or stir-fried morning-glory with oyster sauce, steamed rice, and a Khmer dessert of white pumpkin with a sugary sauce. As usual, I have a glass of red wine. It’s pleasant here on the street of this quaint town, sampling delectable food and watching the tourists and locals traipsing past. The night market blooms with colorful silk scarves, handbags, smiling Buddhas, wooden apsara dancers, T-shirts, pillows, tablecloths, glittery jewelry. So many things to buy, but so little ability to carry them all home. I gaze into big open-air rooms with teak lounge chairs where tourists are having hour-long foot massages for $3. I come away with a handful of scarves for $4 each and a 3-piece Buddha plaque with gold flecks on it. I love this kind of market, much like the Sunday market in Bangkok, with so many enticing things you could spend days there, lost in the glamour of it all. I haven’t had a manicure or pedicure in my whole time in Korea (only a pedicure in Turkey this summer), so I get both in Siem Reap. It’s lovely to sit and be pampered. However, this one pales by comparison to ones I get in the U.S. In the U.S., nail technicians apply a clear top coat to keep the polish from chipping. As they don’t do that here, my fingernails chip by the end of the night! One of the girls in the salon, a beautiful Cambodian with an asymmetrical bob, is happy to see me and asks if I’m from America. I say yes. She says with such a reverent tone in her voice: I love your country. Your country and Canada are the best, because of the people I meet here. They are so nice! But, she says, the ones I don’t like are China, Japan and Korea. Funny, I think, she doesn’t like the other Asian countries, of which Cambodia is one. But. I must admit. Cambodia is different. I see it. They’re definitely Asian, but they have a special culture, one distinguished in class from the others. I need to work on describing the feeling I get when I’m here. Cambodians are so gentle, so delicate yet sophisticated. They’re classy, open, kind-hearted. Lovely. 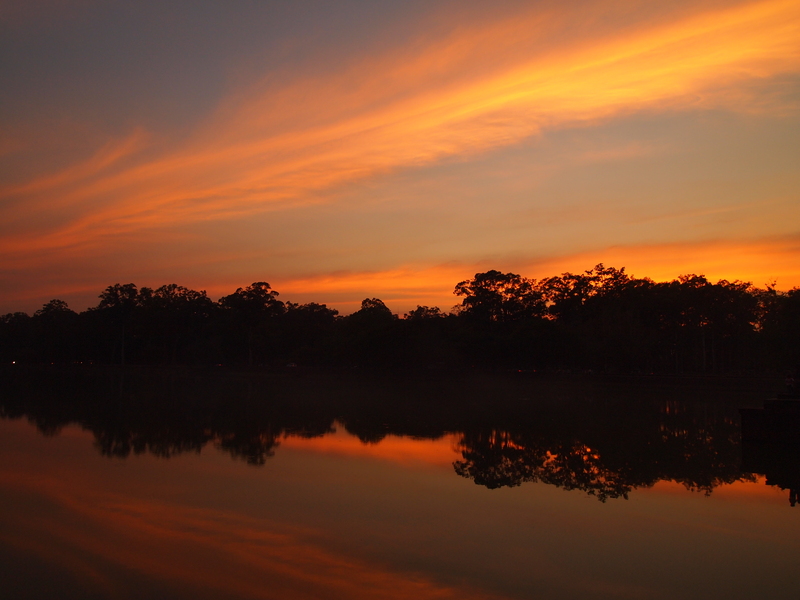 They’re like gold and emerald treasures along the rice paddies and papayas of the Mekong. Butterflies. Tinkling bells. Hummingbirds. Gentle but exquisite in their speech, their music, their movements, and especially, in their hearts. I can’t help but wonder how did the Khmer Rouge ever take root here in this gentle country? How could it have possibly happened?